Every Muslim parent wants success for their child- in this world and the next and to keep them focused on the Straight Path. One of the surest ways to raise one’s child firmly on the deen, is to create a connection with the Quran – the book of Allah – which has been explicitly sent down as a guidance for mankind. For this connection to take place, one needs to create an affinity for this book to inspire feelings of attachment. Understanding the Quran, and exploring its depth will all come later, but as long as parents are able to create an association between the child and the Quran, the most important job of all is done. Here are some do’s and don’ts to help parents create the Quran connection! From the time your children are small (or even when your baby is in the womb), recite the Quran in a beautiful voice. Let the sound of your Qirat be one that creates an instant memory of the love that they have for him. What would be even better is to recite the Quran after Fajr, so that when your child opens his eyes in the morning, the very first sound he hears is that of the Words of Allah. Let your nightly ritual be fun-filled, exciting narrations from the Quran. Don’t only narrate the story, but mention with it the name of the Surah it comes in to create a reference point for them, and hopefully to encourage them to look it up as they grow older. “The best of you are those who learn the Qur’an and teach it.”(Bukhari, sound) Let this be a concept that the child is familiar with. Let him or her know that the Quran is a book of rewards, a feature that no other book can have. Play the Quran in the car or around the house as much as you can. Recite the short Surahs around them so that they can learn them without any effort. When starting a formal learning routine, keep the lesson time short and happy. 10 minutes of attentive lesson time is much better than hours of distracted, uninterested efforts. Do not hurry or be stressed when you sit down with the Quran. Let the Quran time be one full of cuddles, hugs and positive reinforcements. Follow up Quran time with something special, like going to the park, or a yummy snack. 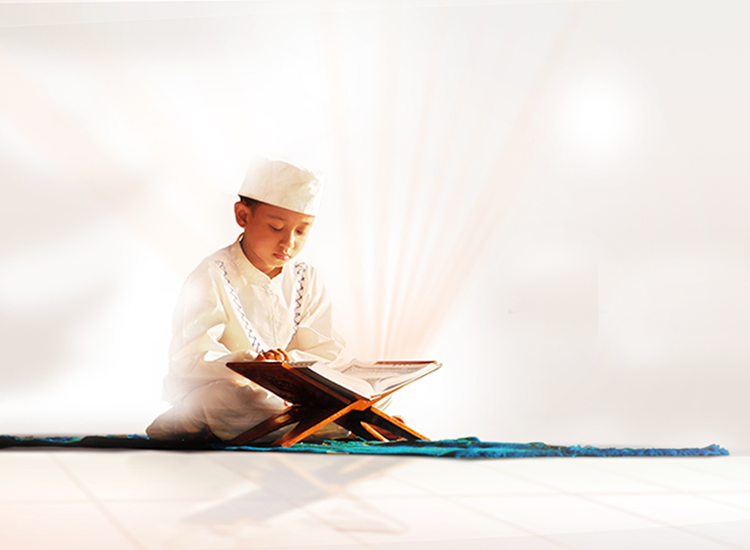 Let your child know that his efforts for the Book of Allah are not going to be wasted in this world or the next. Think up of creative rewards, so that the children do not become to materialistic with excessive gifts. If you like, you can create a healthy competition between your children. Do not compare your children though because each child is unique. What is best is to set different goals for each depending on their capabilities and see who reaches their goal first. As your child becomes better at reciting the Quran, encourage him to memorize portions of the text such as the short Surahs, and some importance ones like Surah Yaseen, Surah Al-Mulk and so on. Tell them the importance of these various Surahs as well so that the child adds to his bond with the Quran. Memorize with your child to encourage and guide as a model. As your child progresses through the different Juz, try and explain some of the verses or give a summary of what the Surahs are talking about. Let your child know that the Quran is not only a book of recitation, but a book that is a guide on how to live our lives. Introduce different Qaris to your children by name and let them hear and recognize their different styles of recitation. Not only that, talk about the lives of these Qaris to create a strong bond with people of the Quran. Aim to do two short Quran sessions a day. The best time is after Fajr, and possibly one right before Maghreb prayer. See what best fits into your schedule. Keep each session short. If you have a tutor teaching your child, either an online tutor or one coming to your home, make sure that you are following his progress on a regular basis. Qutor is a great platform for finding the right tutor for your child, at a time that is convenient for both. As long as you have your laptop and an internet connection, you can be connected to the Quran even when you are on vacation!